Are you a beginner in Table Tennis? Do you wish to challenge your friends in a Table Tennis game? If your answer is yes to the above questions, then we have the perfect table tennis set for you. It is the STIGA Classic Table Tennis Set. You can start a match with your friends using this 4-player classic table tennis that is manufactured by STIGA. The set includes a 4 hardboard classic red and black faced table tennis rackets and 3 white table tennis balls which are a 1-star regulation. A perfect starter kit for your table tennis requirements, the STIGA Classic Table Tennis Set has been approved by the USA Table Tennis (USATT). The rackets are the standard tournament colored rackets. The set comes with 4 rackets in which 2 of them are black faced and the other 2 are red-faced. The rackets are hard bat which has the pips out the rubber on its face. Therefore, the beginners while learning about the rackets would have the exact experience of playing during a tournament. The rackets have a straight handle and a 5-ply blade. These features make the rackets offer a quick play which makes the ball come in a perfect contact with the racket and then making it simple to give an offensive return. Offering a fantastic recreational playability, the rackets are sturdy and comfortable to hold. The performance ratings for the rackets are 28 for spin, 24 for speed and for control it has a massive rating of 48. Having 4 rackets in the set makes it perfect for a family play or recreation. The set comes with 3 white standard tennis balls which reduce the hassle of searching or buying the balls separately. The balls are 1-star which has an approved and standard size of 40mm by the International Table Tennis Federation (ITTF). It makes the perfect combination for beginners. 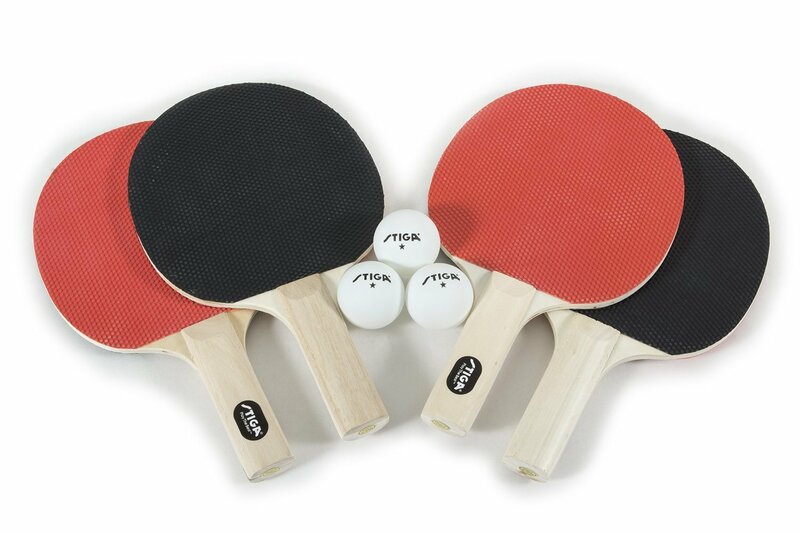 The STIGA Classic Table Tennis Set is perfect for both beginners and family play. The rackets are the standard size and very easy and comfortable to easy. Therefore, the beginners can easily learn how to play table tennis on this racket. In addition to this, it is also suitable for children which make it simple for them. The set comes with 4 rackets and 3 balls and therefore it makes it ideal for family play. You can spend your holidays with your family in a more fun way with this table tennis set. Here is what you would love about the table tennis set. Hard bat styled rackets which are the standard black and red tournament colors. The set comes with 3 white 1- star ping pong balls. They are a perfect standard International Table Tennis Federation size of 40mm. For better grip, while playing the handles are straight with a 5-ply blade. Pips-out rubber on the paddle’s face for superb offensive return and quick play. The paddles are sturdy with the pads securely attached. A good quality tennis racket which is a great value for its price and offers fast and comfortable play. The set comes with tennis balls which make it easier to get the game started rather than having to purchase the balls separately. It is the perfect table tennis set for beginners and especially for children. Some paddles may have rough handles as they have not been sanded well. The paddles may appear to be thin for some users. The tennis balls provided are extra slippery which may crack a little sooner than hoped. Looking to know more about it? Here are some of the questions that you may like. Question: What are the dimensions and weight of the product? Answer: The product is 16*8*6 inches which weigh about 11.2 pounds. Question: Can this set be used for indoor playing? Answer: Yes, the STIGA table tennis set is perfect for an indoor recreation game of table tennis in addition to an outdoor play. Question: What is the size of the tennis balls? Answer: The set has 3 white tennis balls which are the standard 40mm size as set by the International Table Tennis Federation. The STIGA Classic Table Tennis Set is perfect for beginners who wish to learn and play Table Tennis. The rackets and the balls are of the supreme quality which has been approved by the USA Table Tennis (USATT). The rackets are hard-bat styled which have a sturdy paddle for quick play and enhanced ball contact and the white balls have the appropriate size which makes them bounce easily. So, if you are looking for a great worth for its price table tennis set, then look no further than the STIGA Classic Table Tennis Set.